You kind of have to understand the series as a whole to understand this romantic comedy where the love and romance is there - but at arms length (which some see as questionable chemistry but in essence is really on par with the rest of the series in many ways, even though this is a totally new story in the series). With Shu Qi playing the daughter of a Hong Kong crime boss exiled to Korea where Lee Bum-Soo and his pack of Korean bumbling gangsters are forced to keep an eye on her - this is a cute and funny movie (and Yeong Hyeon as the interpreter provide some of the funniest parts in the movie). Who doesn't love this movie? 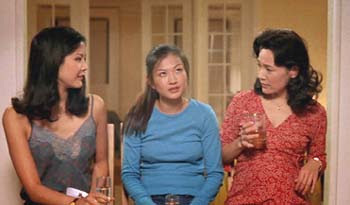 With a great cast of Michelle Krusiec, Joan Chen, Lynn Chen, and directed by Alice Wu, the movie isn't just about two young women falling in love and the quirky and sweet moments that go along with finding a person to take that ride with you - but it's also about the love of family, lost love, the love of community, and those sometimes difficult moments that you have to go through in order to find out who you really can be. Definitely a classic "opposites attract" movie that can be watched over and over again with tons of great romantic moments (like the candy machine scene between Vivian and Wil). This South Korean movie starring Jung Woo-sung and Son Ye-jin has it all - love, romance, laughing, crying - and a great soundtrack to boot. If ten people in a room watch it and there isn't one person that has "something in their eye" by the end of it - that's a jaded group. The story centers around a young woman broken up with a married co-worker who goes back home to live while she mends her broken heart - where afterwards she meets her match and they fall in love, having a great romance - but then tragedy strikes, and you see how they both handle it. A little longer of a movie - but well worth it with some great visuals. This movie isn't so much about love - but in many ways more about the want of love - love lost. It was nominated for a 2003 Independent Spirit Award and focuses around the character of Michael who is torn between two women - his downstairs neighbor who he can't quite have, and a free spirit who he meets - the two sharing more in common than meets the eye. Definitely more of a gritty love story (shot digitally), but worth the watch. No one said love and romance can't be dark - and any movie based on Hamlet is bound to be a little dark. The movie stars Zhang Ziyi, Daniel Wu, and You Ge, and while some questioned Zhang being able to play an "older" empress character - she handles the job quite well - if anything detracts from the film it's actually some of the battle scenes which aren't always needed - but overall, this was good movie to see, especially if you're a fan of any of the actors. Students Speak: "We Want Our Bruce Lee"
Barbara Walters: No Asian Fascination? Dustin Nguyen and "Monk on Fire"